Why was katara and toph fighting during aang's earthbending training in the episode the runaway? They both had hit each other with their bending. 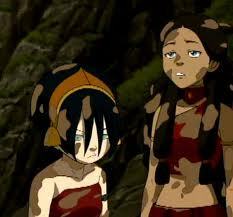 katara had bended water all over toph from the river. They both was fighting in mud. Toph had hit katara with a rock when aang visualized underground.